Home Archive by category "Mercy Health News Releases"
A reception to celebrate the opening of the VCSU Student Art Exhibit at CHI Mercy Health (Mercy Hospital) in the Mercy Art Gallery will be held Thursday, March 7th from 3:30 -4:30 pm. The above pastel entitled ‘Needles”, a work by Zoey Koch is one of the many pieces that will be displayed. The public is invited to attend. Enter by the public entrance to CHI Mercy Health at the main entrance (east side) of the hospital. VALLEY CITY, N.D. (NewsDakota.com) – The VCSU Art Department and CHI Mercy Health (Mercy Hospital) in Valley City are excited to announce their collaboration on a student art exhibition displaying the works of VCSU Art Students at the Mercy Hospital Gallery. A reception to celebrate the opening will be held on Thursday, March 7th from 3:30-4:30 pm in the gallery. The public is invited to attend. The show will be open to the public through the months of March and April. The gallery is located on the first floor of CHI Mercy Health (Mercy Hospital), 570 Chautauqua Boulevard in Valley City. This exhibition will feature the 2-D works of art by the students of Assistant Professor Brock Drenth who is the VCSU Art Department Chair and Assistant Professor Angela Mircsov. The exhibiting artists are: Brenna Winter from Valley City, Isaac Ingstad from Valley City; Alexa McCulloch from Valley City; Zoey Koch from Valley City; Zander Dale from Navajo, New Mexico; Jennifer Schrader from Langden; Shania Schooler from Jamestown; Kallie Fretheim from Valley City; and Laken Chase from Milnor. Everyone is encouraged to attend the opening reception or to come to CHI Mercy Health anytime between 7 am and 10 pm during March and April to see the VCSU Art Department Student Show at the Mercy Gallery. CHI Mercy Health Foundation Receives $1000 From FCCU for Giving Hearts Day! Valley City, ND CHI Mercy Health Foundation received a $1000 donation for Giving Hearts Day from First Community Credit Union of Valley City. The Foundation is thankful to have received this major gift, which brought our Giving Hearts Day 2019 total to $11,000 raised! This year, our goal was to raise enough funds to purchase 2 Vital Sign Monitors and 1 infusion recliner for our Outpatient IV Therapy Department. We are close to having raised enough to purchase the 2 vital sign monitors. Our Ambulatory Care or Outpatient IV Therapy Department is an important service of the hospital and had 600 visits in 2018. This service allows the residents of Barnes County to stay “local” for their infusions and to save anywhere between one to twelve hours of travel time for their treatments. Time matters…CHI Mercy Health…proudly serving the community for over 90 years! CHI Mercy Health Foundation is a nonprofit organization to serve the needs of CHI Mercy Health. The Foundation is dedicated to providing support for Mercy Hospital with supplemental funding for capital and program needs essential to the hospital’s growth and development. Through this service, the residents of Valley City and the surrounding communities have access to local, modern, quality healthcare that allows our family, friends and neighbors to stay close to home for their health needs. Valley City, ND CHI Mercy Health Foundation is excited to announce it is accepting applications for four scholarships it is offering! Each year, two Nursing scholarships are given out to recipients that are enrolled in an accredited nursing program. One of the scholarships is provided by funds contributed by CHI Mercy Health’s Nursing Department which is matched by the CHI Mercy Health Foundation. Finally, there will be two more scholarships offered that are open to anyone pursuing a General Medical career, including technician programs. One of these scholarships is provided by nursing staff fundraisers and the other through the LaVonne Reidman family. So please share this with your co-workers, friends, family and anyone you can think of that may be able to benefit from these funds. Please contact Stephanie Mayfield in the CHI Mercy Health Foundation office (direct #845-6557 or stephaniemayfield@catholichealth.net) to get an application or go online to: www.mercyhospitalvalleycity.org under the Scholarships tab. The deadline to apply is March 31, 2019. The CHI Mercy Health Auxiliary is excited to announce it is accepting applications for scholarship! Each year, one scholarship is given out to recipients that are enrolled in a Medical or Health Care related career. The scholarship is provided by funds raised by CHI Mercy Health’s Auxiliary. These scholarships are intended for students seeking to complete an accredited program in a healthcare related field, including technician programs, certificates, 2-& 4-year degrees. First consideration will be given to current CHI Mercy Health employees, Auxiliary members and their immediate family members living in Barnes County, ND. If there are no applicants that are CHI Mercy Health employees, auxiliary members or immediate family members of an employee or auxiliary member the next eligible applicants will be students in the community that are actively seeking a degree or certification in the healthcare field. Please contact Lisa Urbatsch in the CHI Mercy Health Administration office (direct #845-6486 or lisaurbatsch@catholichealth.net) to get an application or go online to: http://www.mercyhospitalvalleycity.org/scholarships/ . The deadline to apply is May 24, 2019. The CHI Mercy Health Auxiliary (CHI-MHA) is a volunteer organization devoted to supporting the hospital and the community it serves. If you would like to become a CHI Mercy Health Auxiliary member, please contact Lisa Urbatsch at 701-845-6486 or email lisaurbatsch@catholichealth.net. VALLEY CITY, N.D. (NewsDakota.com) – Every year, CHI Mercy Health shows its appreciation to those employees who have reached certain employment milestones. It is part of our culture to thank people for a job well done. It is remarkable and gratifying to have employees who have served CHI Mercy Health for so many years, like the employees below who were recognized for their service during the Hospital Christmas Potluck in December of 2018. VALLEY CITY, N.D. (JRMC) – Miles of travel after a sprain or strain is like adding insult to an already painful injury. Valley City, ND CHI Mercy Health is promoting Breast Cancer Awareness during the week of October 8th through the 14th. Please join the Radiology Department for an Open House on Friday, October 12, 2018 from 1:00 to 2:00 pm. There will be treats, door prizes and tours of the DMS Technologies Mammography Mobile Unit. All mammography patients that day will receive a rose. Below is a picture of the display of activities for the week including “Give Cancer the Boot Decorating Contest”. Proceeds from activities are going to the North Dakota Women’s Way Program. Breast Cancer Screening saves lives! Please contact CHI Mercy Health Radiology at 701-845-6441 for any questions or an appointment. L to R Taylor Bearinger and Francis Yokom. 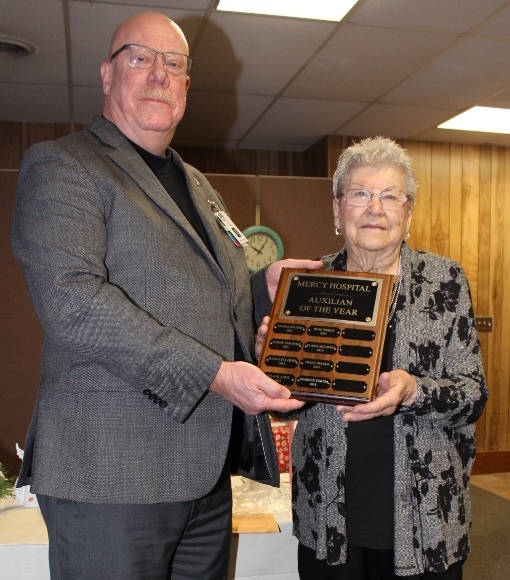 VALLEY CITY, N.D. (NewsDakota.com) – CHI Mercy Health Auxiliary announced the recipient for 2018-2019 school year. Taylor Bearinger of Valley City is presented the 2018 scholarship by Frances Yokom, President, CHI Mercy Health Auxiliary. Taylor was awarded a $250 scholarship to use toward Healthcare Education. Taylor is enrolled at Valley City State University. Each year, one scholarship is given out to recipients that are enrolled in a Medical Health Care related career. The scholarship is provided by funds raised by CHI Mercy Health’s Auxiliary. VALLEY CITY, N.D. (NewsDakota.com) – Mark Oberlander will retire from the CHI Mercy Hospital Governing Board after 5 years of service as its chairman. Keith Heuser, President of CHI Mercy Health in Valley City said it is remarkable and gratifying to have a community member like Mark who has served CHI Mercy Health for so many years. 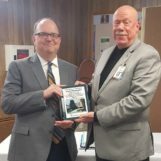 Oberlander was recognized on April 12th at the CHI Mercy Health Governing Board Meeting in Valley City. He served on the board from July 1, 2009, his term will end on June 30, 2018. Finally, there will be two more scholarships offered that are open to anyone pursuing a General Medical career, including technician programs. One of these scholarships is provided by nursing staff fundraisers and the other through the LaVonne Reidman family. So please share this with your co-workers, friends, family and anyone you can think of that may be able to benefit from these funds. Please contact Stephanie Mayfield in the CHI Mercy Health Foundation office (direct #845-6557 or stephaniemayfield@catholichealth.net) to get an application or go online to: www.mercyhospitalvalleycity.org under the Scholarships tab. The deadline to apply is April 9, 2018. Valley City, ND CHI Mercy Health, in collaboration with the City-County Health District and the Valley City Cardiac Ready Community Coalition are excited to announce the First Annual Community Health and Wellness Fair, on Saturday, March 24, from 2:00pm-5:00pm at the Valley City Eagles Club. This is a free event that is open to the public and will include: education and meet-and-greets with local health and wellness providers, wellness incentives to register for (quantity 4 of the Fitbit Charge 2 and quantity 1 Bong’s Bootery Gift Certificate for $100), healthy snacks, blood pressure checks, learn basic CPR compression techniques, and the event will close with motivational speaker, Teresa Lewis, from 4-5pm. “Get Inspired with Teresa Lewis”, motivational speaker, 7 Mindsets Coach, and Life 97.9 Morning Radio Co-Host, as she discusses the challenges we face while striving to create a healthy lifestyle. Teresa will motivate you as you embark on a holistic approach to wellness that includes stress management techniques, the importance of setting goals, and, ultimately, holding yourself accountable on your journey. This event was made possible through a Grant awarded to CHI Mercy Health by the ND Medicare Rural Hospital Flexibility Program. 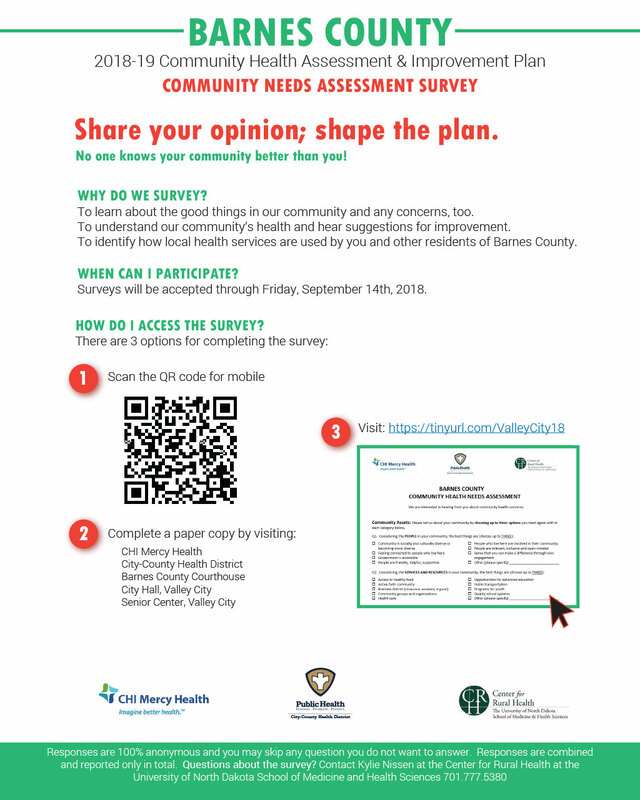 This FLEX Grant represents a Collaborative Population Health Improvement Activity between CHI Mercy Health and Valley City-County Health District. Funds are subcontracted through the Center for Rural Health which is designated as the North Dakota State Office of Rural Health, a federal-state partnership that helps rural communities build their healthcare services through collaborations and initiatives with a wide range of partners across the state. Join us Saturday, March 24, from 2:00pm-5:00pm, for an afternoon filled with community fellowship as you meet our local Health and Wellness providers, enjoy an inspiring speaker, and receive a copy of the new “Valley City Health and Wellness Resource Guide”! If you are a Health and Wellness provider in our community and did not receive the invitational letter–please contact me to register! We have invited all of the healthcare and overall wellness providers that we know. From Clinics, dentists, optometrists, massage therapists—we have extended an invitation for a free booth at the event. Please contact Stephanie Mayfield in the CHI Mercy Health Foundation/Mission office (direct #845-6557 or stephaniemayfield@catholichealth.net) with any questions you have regarding the event. VALLEY CITY, N.D. (NewsDakota.com) – Local photographer Alice Beauchman has an exhibit of her work now showing at the Mercy Art Gallery located at the gallery space in CHI Mercy Health leading to Sanford Health. It is open to the public from 7 am to 10 pm. Alice is an Administrative Assistant at Valley City State University Rhoades Science Center. For many years she taught photography classes at the university. her photography students number over 2,300 during those years. Alice signed up for a photography class in college, and at that point discovered a passion that would last a lifetime. Most of her shooting is nature related, favorite subjects are landscapes, flowers, and birds. A highlight on the bird photography was a two-week trip to Ecuador and staying at five lodges catering to birders. She also likes shooting and creating (in Adobe Photoshop) slightly dark, eerie images. Alice lives in Valley City, with her husband, Jan. She has three grown children, and five grandchildren; all who graciously agree to be subjects for her photos. This has at times involved costumes and posing as ghosts, pirates, vampires, dead bodies, space creatures, etc. So far no one runs and hides when she says, “I have a great idea for a photo”. 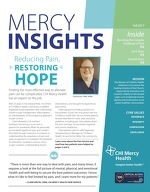 Winter 2018 Mercy Insights Newsletter. L to R: Valley City Police Lt. Dana Rustebakke and CHI Mercy Health President Keith Heuser. VALLEY CITY, N.D. (NewsDakota.com) – CHI Mercy Health’s donation of $281.05 was presented to Valley City Police Lieutenant Dana Rustebakke at the annual employee Holiday Potluck in the month of December of 2017 . “We are proud to be a part of this community and are happy to be able to give back” said Keith Heuser, President, CHI Mercy Health. Pictured: Kendra Krueger (AHA), Shila Thorson (NDDOH), Dr. Jeff Sather (NDDoH), Mylynn Tufte (NDDoH), Karalee Harper (AHA), Alana McClennan (CHI), and Dan Schaeffer (Metro Ambulance). BISMARCK, N.D. – The North Dakota Department of Health (NDDoH) received a $97,964 from the American Heart Association (AHA) at a news conference on Thursday, Nov. 2. The funds were made possible by donors who contributed to the Impact Foundation during Giving Hearts Day. The funds will go to support Cardiac Ready Communities across the state by ensuring rural areas are equipped to handle cardiac emergencies. BISMARCK, N.D. (NewsDakota.com) – The North Dakota Department of Health (NDDoH) will be awarded a $97,964 check from the American Heart Association (AHA) at a news conference on Thursday, November 2nd, at 10:00 a.m. in the Emergency Preparedness and Response (EPR) building. Representatives from the AHA and the North Dakota Cardiac Task Forces will emphasize the impact of the timely intervention for heart and stroke events. Members of the media may attend the news conference at the Emergency Preparedness and Response building, located at located at 1720 Burlington Drive in Bismarck or connect to the press conference by dialing 855.235.2064. For more information about the event, contact Jennifer Skjod with the North Dakota Department of Health, at 701.328.1665. Jamestown is working on becoming a cardiac ready community as well. Click here to read more. VALLEY CITY, N.D. (NewsDakota.com) – Area artist, Sarah Lerud’s paintings are on display at the Mercy Art Gallery located at the gallery space in CHI Mercy Health leading to Sanford Health. Spokeswoman Sharon Buhr said Valley City, Washington, D.C., and Norway are the three main themes expressed through her work. Lerud is fascinated with the memories of places and wants her paintings to express the feelings of these sites. She uses pastels and oils to transform her thoughts and memories into color while representing architectural buildings, monuments and statues. Included in her Valley City work are the Hi-Line Bridge, the front yard where she grew up, her grandmother’s home near Marion and artwork by her son, Jack. Buhr said the Washington, D.C. pieces reflect on her time living in Washington, DC and visiting the monuments with her family. The Vietnam Veterans Memorial Wall is the monument held dearest to her heart because of the influence her Vietnam Veteran dad has had on her. Her dad lost his sight along with two friends standing on either side of him in combat. The etchings of the names from the Wall in her paintings are those friends’ names. The Norway artwork echoes her time spent in or near Oslo, Norway with her brother. The Oslo pieces include the Norwegian Parliament building, The Norwegian National Theater, the Theatercafeen and sculptures from the famous Vigeland Park. The barn, the front door, and the church are from her great-great-great-great grandmother’s farm and home town. Lerud is the librarian at the Valley City Junior-Senior High School. The artwork will be on display now through the end of December of 2017. 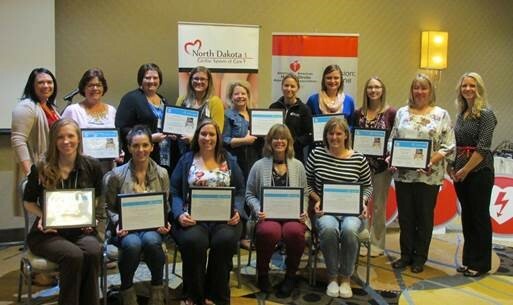 Awards recipients pictured at the North Dakota State Stroke & Cardiac Conference held Sept. 25-26 in Bismarck. BISMARCK, N.D. – The North Dakota Stroke System of Care Task Force recently awarded several critical access hospitals for demonstrated quality excellence in stroke care. The task force recognized the awardees through data collected from hospitals by the North Dakota State Stroke Registry. For more information, contact Shila Thorson, North Dakota Department of Health, at 701.328.4569. Purchase Festival of Trees Tickets! Click here to purchase Festival of Trees Tickets! 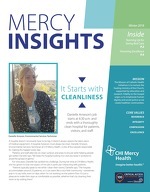 Are you receiving Mercy Insights? 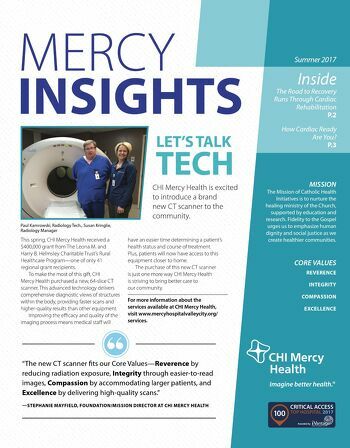 In September, CHI Mercy Health launched a community newsletter called Mercy Insights which replaces The Communicator and will arrive in your mailbox three times a year. Our goal is to keep you better informed about the services we offer and keep you better connected to your hospital, which is here for you 365 days a year. VALLEY CITY, N.D. (NewsDakota.com) – The Young People’s Healthy Heart Program, previously located at CHI Mercy Health will be fully operational inside the City County Health District office in Valley City starting July 1st. The program originated in 1980 through a grant that Sharon Buhr, MPH, LRD, and director of the program, wrote to the North Dakota Department of Health related to heart health. CHI Mercy Health is excited to continue holding monthly, free, community health workshops at the Gaukler Family Wellness Center over the summer months. We have held monthly workshops since January including topics such as: Organ and Blood Donation, Heart Health and Fitness, Healthy Heart Tips and Tastes, Domestic Violence Awareness, and two Free CPR classes. Our next workshop is scheduled for Tuesday, June 20, from 7:00pm-8:00pm in the first floor conference room at the Gaukler Family Wellness Center. The topic will focus on Chronic Pain management. Our workshop will be led by CHI Mercy Health’s Chief Nurse Anesthetist, Clark J. Kruta, CRNA, APRN, MA, and Operating Room Manager Stephanie Kruta, RN, MSN, to learn about effective treatments for Chronic Pain. Chronic pain is best managed if the plan of care is individualized to each patient. It should include at a minimum: physical therapy evaluation and stretching, regular exercise, education on self -care (sleep/nutrition/lifestyle), and behavioral health care. Learn about effective methods to treat chronic pain including pain injections. It is the mission of CHI Mercy Health to “…create healthier communities.” and we are bringing these monthly, free to the community workshops to help local individual’s lead healthier lives. Part of these workshops is funded through a Center for Rural Health Flex Collaboration Grant that CHI Mercy Health was awarded. Please contact Stephanie Mayfield in the CHI Mercy Health Foundation/Mission office (direct #845-6557 or stephaniemayfield@catholichealth.net) with any questions you have regarding any of the workshops. CHI Mercy Health in Valley City, ND was recently named one of the Top 100 Critical Access Hospitals in the United States by iVantage Health Analytics and The Chartis Center for Rural Health. CHI Mercy Health scored in the top 100 of Critical Access Hospitals on iVantage Health Analytics’ Hospital Strength INDEX®. The INDEX is the industry’s most comprehensive rating of rural providers. It provides the data foundation for the annual Rural Relevance Study and its results are the basis for many of rural healthcare’s most prominent awards, advocacy efforts and legislative initiatives. The list of the Top 100 Critical Access Hospitals and more information about the study can be found at www.iVantageINDEX.com. The Chartis Group (Chartis) is a national advisory services firm dedicated to the healthcare industry. Chartis provides strategic planning, value-based care, advanced performance, informatics and technology consulting services as well as leading-edge decision support tools to the country’s leading healthcare providers. The Chartis Center for Rural Health (CCRH) was formed in 2016 to offer tailored services, performance management solutions, research and education to rural hospitals and facilities. Learn more at Chartisrural.com. iVantage Health Analytics is a subsidiary of The Chartis Group and a leading provider of healthcare analytic and performance management analytic tools. Health system and hospital leadership teams across the country rely on the company’s software and services to deliver customized insights on clinical and financial performance, strategic planning, market assessment and payment optimization. iVantage’s analytics are the basis of continuing thought leadership and insight in the areas of healthcare policy and research. Learn more at iVantageHealth.com. Valley City, ND CHI Mercy Health is excited to announce it will begin holding monthly, free, community health workshops at the Gaukler Family Wellness Center beginning Wednesday, February 15. The first workshop entitled “Organ and Blood Donation” will be held on February 15 beginning at 7pm in the 1st Floor Conference Room at the Wellness Center. It will feature Lifesource Liason, Barb Nelson-Agnew speaking about the importance and process of organ donation. We will also have on hand, CHI Mercy Health ER manager Alana Wendel and Lab manager Susan Kringlie to talk about the importance of local blood and organ donations. We will also help people sign up to be Organ Donors if they choose to be and have some organ donation awareness gifts for all in attendance. The second workshop will be held on February 22 in Room 156 at the Wellness Center. It is called “Heart Health and Fitness” as February is Heart Health Month. Join CHI Mercy Health’s Sharon Buhr and VCSU Assistant Professor of Kinesiology & Human Performance, Sarah Milner for a complimentary Body Composition Test ($20 value) and find out what your test results mean to your health and how to create fitness goals to strengthen your heart. This class is limited to the first 20 people who register by calling: 845-6456. The third workshop will be on March 23 in the Party Room at the Wellness Center. It will be called “Healthy Heart Tips and Tastes” and will feature a live, healthy cooking demonstration and samples! In addition, all registrants will receive a complimentary cookbook ($25 value) called “America’s Test Kitchen Healthy Family Cookbook”. Please register by calling 845-6456. It is the mission of CHI Mercy Health to “…create healthier communities.” and we are bringing these monthly, free to the community workshops to help local individuals lead healthier lives. Part of these workshops is funded through a Center for Rural Health Flex Collaboration Grant that CHI Mercy Health was awarded. Please contact Stephanie Mayfield in the CHI Mercy Health Foundation/Mission office (direct #845-6557 or stephaniemayfield@catholichealth.net) with any questions you have regarding any of the workshops. Valley City, ND The CHI Mercy Auxiliary is excited to announce it is accepting applications for scholarship! Each year, one scholarship is given out to recipients that are enrolled in a Medical Health Care related career. The scholarship is provided by funds raised by CHI Mercy Health’s Auxiliary. Please contact Lisa Urbatsch in the CHI Mercy Health Administration office (direct #845-6486 or lisaurbatsch@catholichealth.net) to get an application or go online to: http://www.mercyhospitalvalleycity.org/scholarships/ . The deadline to apply is May 26, 2017. Valley City, ND CHI Mercy Health Auxiliary is excited to announce its recipients for 2016-2017 school year. The first recipient is Maia Wendel of Valley City. She was awarded a $250 scholarship to use toward the Healthcare Education she is enrolled in at Moorhead State University, MN. The second recipient is Tarryn Justesen of Valley City. She was awarded a $250 scholarship to use toward the Nurse Program she is enrolled in at Moorhead State Community and Technology College, MN. Each year, one scholarship is given out to recipients that are enrolled in a Medical Health Care related career. The first scholarship is provided by funds raised by CHI Mercy Health’s Auxiliary. The second $250 scholarship is a one-time memorial/donation from the family of Mertice Rood (a Graduate of the Mercy School of Nursing at Mercy Hospital in Valley City and an active Mercy Hospital Auxiliary member) and is specifically for someone seeking a degree as a nurse. These scholarships are available to local students pursuing a healthcare or nursing career. The CHI Mercy Health Foundation would like to announce the LaVonne Reidman Scholarship recipients for the 2016-2017 school year. Brienne Roehrich, Valley City, ND, has been chosen to receive the LaVonne Reidman Nursing Scholarship. This year the award was $1000.00. Brienne is enrolled in the Nursing Program at the University of Jamestown in Jamestown, ND. Camille Kawasaki, Valley City, ND has been chosen to receive the LaVonne Reidman Memorial Medical Scholarship. This year the award was $350.00. Camille is enrolled in the Medical Laboratory Science program at Northern State University, Aberdeen, SD. The family of LaVonne Reidman established these scholarships in 2005, in memory of LaVonne and her dedication to the nursing profession. Lavonne was a wonderful, caring nurse for many years at Mercy Hospital in Valley City. CHI Mercy Health Foundation is managing this scholarship for the Reidman Family. The amount of this scholarship can increase every year as the Reidman’s add to the fund. If you would like more information about this scholarship opportunity, please contact Stephanie Mayfield, Director of CHI Mercy Health Foundation, at 701-845-6557 or e-mail: stephaniemayfield@catholichealth.net. Valley City, ND The CHI Mercy Auxiliary is excited to announce it is accepting applications for two scholarships it is offering! Each year, one scholarship is given out to recipients that are enrolled in a Medical Health Care related career. The scholarship is provided by funds raised by CHI Mercy Health’s Auxiliary. The second $250 scholarship is a one-time memorial/donation from the family of Mertice Rood (a Graduate of the Mercy School of Nursing at Mercy Hospital in Valley City and an active Mercy Hospital Auxiliary member) and is specifically for someone seeking a degree as a nurse. Please note on Application you are applying for the “Mertice Rood Nursing Scholarship”. Please contact Lisa Urbatsch in the CHI Mercy Health Administration office (direct #845-6486 or lisaurbatsch@catholichealth.net) to get an application or go online to: www.mercyhospitalvalleycity.org under the Scholarships tab. The deadline to apply is May 27, 2016. Valley City, ND Mercy Healthcare Foundation is excited to announce it is accepting applications for three scholarships it is offering! Each year, two Nursing scholarships are given out to recipients that are enrolled in an accredited nursing program. One of the scholarships is provided by funds contributed by Mercy Hospital’s Nursing Department which is matched by the foundation. The second Nursing scholarship comes from a fund set up to honor LaVonne Reidman. The family of Lavonne Reidman established this scholarship in 2005 in memory of Lavonne and her dedication to the nursing profession. Lavonne was a wonderful, caring nurse for many years at Mercy Hospital in Valley City. Mercy HealthCare Foundation is managing this scholarship for the Reidman Family. Finally, there is a third scholarship offered that is open to anyone pursuing a General Medical career, including technician programs. So please share this with your co-workers, friends, family and anyone you can think of that may be able to benefit from these funds. Please contact Stephanie Mayfield in the Mercy Healthcare Foundation office (direct #845-6557 or stephaniemayfield@catholichealth.net) to get an application or go online to: www.mercyhospitalvalleycity.org under the Scholarships tab. The deadline to apply is May 15, 2016. It seems the rumor that CHI Mercy Health is closing is again resurgent, giving a sense of accuracy to Twain’s aphorisms. This rumor comes around through the community almost like a seasonal virus and affects everyone throughout. Our patients, our employees, our Board members, and everyone who depends on us to be here ready to provide unsurpassed care are affected by this rumor. This rumor remains because of the changes we’ve made to the hospital over the last number of years. It’s understandable that people will jump to conclusions–I probably would, too, not knowing the factors influencing the changes. At its core, a hospital is a place for caring, healing, and taking care of the community, but it is also a business. When a business suspends some services it certainly can appear that it is in trouble. Let me assure everyone, emphatically, right now: CHI Mercy Health is not in trouble. A hospital is this center of healing, but it is also a business. The difficulty for any rural hospital is size. When you have a large population base and a large physician referral base, hospitals do very well. But in a community our size, where fewer than half population use our hospital, it’s very difficult to offer a multitude of services. Any business owner will understand and tell you that any product or service has a critical mass needed to make it profitable to carry or offer, and without that critical mass of customers, without that return on investment, you can’t offer services or products that cost money. This holds true for a hospital. We have closed down services that have been a cost burden or compliance nightmare (with ever changing federal regulatory requirements) so that we can keep the emergency room and other core services of the hospital viable. Offering services that don’t help our bottom line or that require an inordinate amount of time and expense take money directly from other necessary and vital health care services that we need to provide this community. What we’re doing is working, which is why we won’t and aren’t closing. We offer this community a wide range of health services in a changing, transformative time for the health care industry as a whole. We offer cardiac rehab, physical therapy, sleep studies, swing beds, DEXA, mammography, CAT scans, and a diversity of same-day surgeries (from ophthalmological to endoscopy), and pain management. And we have a Class I trauma center utilizing state-of-the-art telemedicine. Most important, our staff is simply the best anywhere, and comprised of people you most likely know and certainly trust. This year we are above budget, which, if you pay attention to the news, is the exception nationally. Nationally, most hospitals are losing money. No, we aren’t going anywhere anytime soon. There will changes in how hospitals offer health care as we continue to move from acute to ambulatory care. We will adapt to the changes, we will continue to offer wonderful care, and CHI Mercy Health certainly will not be closing. Keith Heuser is the Market President for CHI Mercy Health, Valley City. Women should get their yearly screening from their primary caregiver, and then call as no referral is needed, to CHI Mercy Health to make an appointment. Just ask us to schedule you an appointment. CHI Mercy Health has a host of events scheduled for Breast Cancer Awareness. Go to our Facebook page to see what’s going on during the week of Oct. 26-31. Suicide is not a pleasant topic. It is a trammeled subject in polite conversation; a personal scar born of knowledge the name of whom is seldom spoken. More than 41,000 people kill themselves annually in the U.S., but more than 1 million people attempt suicide. Thirteen years ago, Barnes County had the highest suicide rate in the state, and for eleven years Debbie Anderson has tried to lower that number to zero. Wellness in the Valley began with three full-time employees, and by its third year had trained nearly 3,200 people in suicide prevention and awareness training. Today, the only employee is Anderson, and the program is funded through CHI Mercy Health. A condition of the HRSA grant was that “Wellness” could not charge for services. Health and Human Services, the granting agency, thought that businesses would keep the program running. Anderson, however, seems inexhaustible working more hours than possible and staying on-call for interventions or counseling. She has, through “Wellness,” provided over 62 unpaid counseling sessions; taken part in 48 immediate threat suicide interventions in the last twelve months; taken part in two cancer groups; two depression groups; conducted two “gatekeeper” (interventionist) trainings; and two Applied Suicide Intervention Skills Training (ASIST). And she has given the teachers in the Valley City School District their mandatory two-hour state-mandated suicide training. She’s also a resource for the police and fire departments. The big event and fundraiser for Wellness in the Valley is the annual Out of Darkness Walk. This year’s walk is October 10, 2015, at 12 p.m., the same day as the Dakota State University-VCSU game and on the VCSU campus. For more information about the Out of the Darkness Walk, or Wellness in the Valley, call 701-845-6436, or log on to the American Foundation for Suicide Prevention AFSP.org/walk. O, to sleep, to dream, and to wake up without feeling beat up , exhausted, and ready for a nap. Sleep apnea, restless legs, insomnias, parasomnias–there are categories and subcategories of all that steals sleep. Quite a few sleep disorders will actually affect good health: sleep terrors, REM disorders, obstructive sleep apnea can with frequency affect mental as well as physical health. Fortunately there are sleep study centers today, and in Valley City is lucky enough to have one. CHI Mercy Health has opened a sleep center in the hospital. The center is run by Whitney Sleep Diagnostics & Consultants of Detroit Lakes, and coordinated by Karen Burchill for the hospital. The studies are conducted right in the hospital and patients receive follow up from a Board Certified Sleep Specialist. “Traditionally in a smaller town,” said Jim Dunn, “the patient and his or her healthcare provider saw the results of the sleep study for the first time together and had to figure out what it all meant. Now the patient can talk directly to the Sleep Specialist who interprets their study via telemedicine right at CHI Mercy. We are able to diagnose, treat and provide continued follow up for most sleep disorders right in Valley City.” Dunn is Whitney Sleep’s Director of Business Development, and a Whitney Sleep success story himself. There are eighty-four different sleep disorders, said Dunn, with insomnias the most prevalent, but Obstructive Sleep Apnea are the most commonly worked with. There is a simple diagnostic chart that may indicate a need for a sleep study. Snoring, excessive daily fatigue, hypertension, a large neck size are among the symptoms and an individual who exhibits two or more should consult a doctor, who may then refer the individual for a sleep study. Patients for the sleep studies are all referred by a healthcare provider. For more information, contact CHI Mercy Health at 845-6400. Or ask your physician to refer you to Mercy for a sleep study with Whitney.